Discussion in 'Shows & Conventions' started by darthskellington, Jan 8, 2011. All-Con is an awesome convention for anyone in the Dallas vicinity. It's a small, friendly convention with lots of fun content. It also has a dealer room with a little bit of everything, and a few celebrity guests each year. It's also something of a homecoming event for the 501st Legion's Star Garrison, so expect to see lots of Star Wars costumes and a Droid Hunt. This will be our third year attending, and we're really looking forward to it. If you are anywhere within driving range of Dallas, you should really consider checking it out. And there is a Ms. Star Wars contest on Saturday afternoon. The 2011 All-Con theme is Steampunk. Whether you're crew on an airship, integrating steampunk genera into your current costume of choice, or coming to All-Con to learn what steampunk is all about there are plenty of discussion panels, workshops, and performances to keep you engaged all weekend. One of the highlights of the convention is the Steampunk Ball on Saturday night. With over 100 events to choose from, what will you choose to do at All-Con? 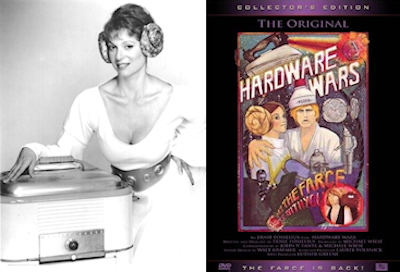 Actress Cinthia Freeling, who portrayed Princess Ann Droid in Hardware Wars, will be attending All-Con on Saturday and signing autographs for her 30 plus years worth of Hardware Wars fans. What is Hardware Wars??? "Hardware Wars is a parody of Hollywood coming attractions that took on the cultural juggernaut that was Star Wars. Complete with cardboard sets and visible wires holding up ships which were various household appliances. The film was shot over 4 days with a budget of around $800. When released, the film became a monster hit on its own, one of the most popular and profitable short films of all time. Winning awards at many international film festivals. This is a rare appearance for Ms. Freeling, and an opportunity you won't want to miss to meet an actress from one of the most significant and influential fan film productions on record. Yay! A new autograph to get. Thursday Warren and I helped with set up, at All-Con if you volunteer at least 8 hours you earn a free badge for next year. So basically you buy your badge the first year you go and then volunteer, you never have to buy a badge again! Friday I volunteered in the morning, setting up the volunteer desk and answering people's questions, then checking badges at one of the entrances. Warren and I went to the game show "Fandom At Random Password", where Warren was selected to be a contestant. His opponent was his friend Phil, who has a Vader costume in the 501st Legion. Phil won the game, and his son got a cool Star Trek Enterprise ship. Later Warren and I were selected to play "United States of Geekdom's Ultimate Geek Challenge", along with 2 other contestants. I placed 1st and Warren came in 2nd, so we must be very geeky!! I won a Master Replicas .33 scale ESB Han Solo Blaster, and Warren won a Diamond Select Spider-Man 3 bust. Then we went to a showing of Dr. Horrible's Sing-Along Blog. Luckily we got there early and snagged a seat because it was standing room only! It was great to hear 100+ nerds singing in tune to all the great songs. Plus comments from the crowd made it feel like Mystery Science Theatre 3000, but with a good movie! Japan's MIQ performed a concert on Friday night, she is the queen of Anime singers, known for the theme songs for "Gundam 0083", "Area 88", "Xabungle Graffiti" and more! She performed as well as her protege group, MIQ Force. We were really glad to have them in Dallas, after the earthquake and tsunami happened right before the convention. Saturday I wore my Princess Leia costume. The 501st Legion had the Droid Hunt that day, so Warren wore his Imperial Guard and gave out raffle tickets to those with droid hunt badges. I didn't have my badge for very long as this stormtrooper spotted it and made me give it up! I went to the Learn to Knit panel, where I successfully learned how to knit. Hopefully with enough practice I can make some R2 hats soon! Then we went to "JediCole's Prize Pile" and while we didn't get a chance to compete for the huge prize pile, we had a good time watching the contestants try to beat Cole's massive trivia knowledge. Alas, Thomas did not beat Cole, but did answer 6 out of 10 final round questions correctly, almost beating Cole's score of 8! 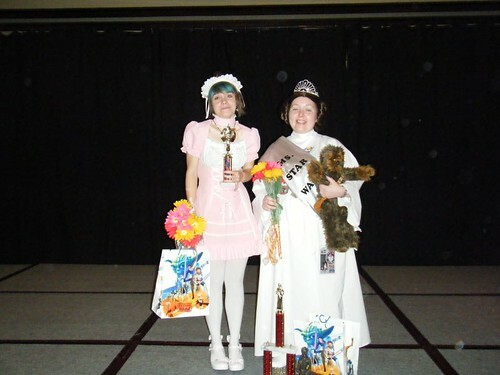 Then the event I had been waiting for, The Ms. Star Wars contest! I placed runner-up in 2010, so I was there to win that crown! There were 9 contestants total, including a Twilek, Queen Amidala and a Jedi. They made us compete in challenges, including dancing for the mighty Jabba, using a lightsaber to deflect Nerf darts shot by Boba Fett, Star Wars Jeopardy, and the worst challenge of all, we had to sing The Life Day song from The Star Wars Holiday Special. Luckily after much audience input, they let us sing it as a group, instead of each of us singing the song and making everyone hear it 9 times! The competition was fierce, but I won!! I got a crown, sash, silk flowers, a trophy, a custom Slave Leia statue, and a goody bag of SW pencil tins, stickers, temporary tattoos and an easter egg coloring kit! And I get to be a judge in 2012. It was great. Saturday evening I volunteered and worked security. I do not recommend working security on Saturday night. There was a private non All-Con St. Patrick's Day party going on in the hotel and I kept having to tell drunk guys that they could not walk through the con hallway without a badge. They ignored me of course and I had to chase them down the hall and make them go back. I want to thank Jeff and Amber and all my friends who consoled me after I left my shift in tears that night! The chocolate Han in Carbonite Amber gave me made me feel much better, especially after I bit his head off! Sunday was the last day of the con. We woke up early to go to "JediCole's Morning After" which started at 9am. It is a great panel, and they even provide cereal and milk to those dedicated enough to get up that early (or those who haven't gone to bed yet). After that was the "United States Of Geekdom's Con Wrap-Up", which was a live podcast. Then the other event I had been waiting for "Don't Lose Your Geek Card" I won this game last year, and I was selected to play again this year! Sadly, I came 3rd, but I did win a Jim Lee Superman poster and a die-cast Star Wars Tantive IV model. Then I volunteered to shadow the con staff, which gave me a lot of exercise because Todd was asking the vendors if they wanted to pre-pay to reserve a spot for 2012, so we ran up and down the stairs from the dealer room to the registration desk where the credit card machine was more times than I could count. After 4 hours of running the stairs, my shift was over and I caught the very end of the Super-Hero Sunday competition. I won a prize in PurrKayla's raffle benefiting KittiCo Cat Rescue, an adorable poster by Halo Seraphim! Then it was time for the Volunteers event. You get a raffle ticket for each hour you volunteer, and there are all sorts of great prizes. I had 18 tickets, and I won 2 great prizes, a 2011 Steampunk theme All-Con volunteer mug and an autographed 8x10 of Orli Shoshan. (Who was a guest at the con) They also threw stuffed All-Con critters into the audience and I got an adorable monkey! (Haven't you always wanted a monkey?) We all noshed on pizza and had a good time. After that, it was time to pack up the con. Warren and I and a bunch of other dedicated (crazy?) volunteers packed up and helped load the U-haul. We logged 3 hours of volunteer time for next year already! Then we headed to one of our favorite restaurants in the Dallas area, The Fish Shack with a few of our friends, and relaxed and talked about how great All-Con was. The theme for 2012's All Con is :"The End Of The World" and it will be March 16-18. If you buy your badge before the end of June it is only $30. That is good for all 3 days! It is a great con, about 2,000 people attend so it isn't overwhelming. I would recommend it to everyone!